Arthur Bassett was born in Kenfig Hill on 25th June 1914 and played for several clubs before joining Cardiff during 1935/36 season. At the same time, he played for the Glamorgan County Police Team on Wednesday afternoons (rain or shine) for charity, travelling to away games using a black handsome cab as transport. Internationally, he gained six caps for Wales, the first in 1934 against Ireland and the last in 1938 against Scotland at Murrayfield. In 1939, after 101 games for Cardiff, he signed professional forms to play Rugby League for Halifax and then moved to York in 1948. 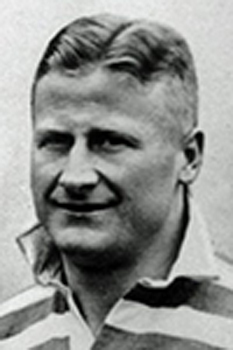 Arthur gained international honours at Rugby League playing for Great Britain (winning 2 caps in 1946) and Wales (gaining three caps between (1939 and 1946). After retiring Arthur became a publican. Arthur Bassett passed away on December 30th 1999 in Matlock aged 85.